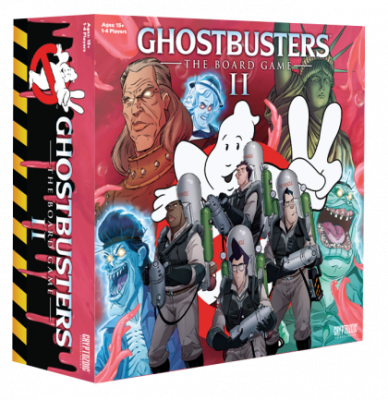 GHOSTBUSTERS: THE BOARD GAME II is ready to take retail stores around the world by storm! 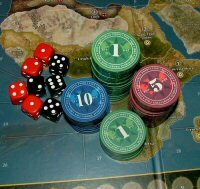 Building on its highly-regarded predecessor, this massive stand-alone expansion has 1-4 players taking on the roles of the Ghostbusters as they investigate the Mood Slime that has flooded the city, causing earthquakes and riots in an attempt to bring Vigo and his minions back. Inspired by the Ghostbusters movies, comics, and toylines, the Campaigns have you taking on the Scoleri brothers, riding the Statue of Liberty, and battling through Vigo’s Ghost army. The numerous new Ghosts, enemy types, and Bosses will make busting an exhilarating challenge! There are many exciting new gameplay elements that add loads of complexity and fun. Equipment Cards offer an array powerful of Weapons, devious Traps, magical Tomes, and helpful Utilities that you’ll need to use to win. As you level up your Ghostbusters, the updated Character Cards will show you what you’ve unlocked, including abilities, Class-S Equipment, and use of the Ecto-1a’s Ecto-Tank. The Ecto-Tank is a fresh piece of technology installed in the Ghostbusters’ favorite ride that recycles negative Mood Slime into rule-bending bonuses! The game features highly-detailed figures based on original designs by Dan Schoening and an original story by Erik Burnham, both veterans of IDW’s Ghostbusters comic book series. Each Ghostbuster has two figures that you can switch between during gameplay—a Proton Pack version and Slime Blower Pack version—depending on the supernatural adversaries you’re trying to trap. All these new features add up to an exciting adventure across three Campaigns, totaling 12 scenarios! Each playthrough of GHOSTBUSTERS: THE BOARD GAME II is absolutely unique: The Equipment you recover, Events you tackle, and tactics you learn are never the same twice!